This has companies around the world struggling to adapt to a new recycling industry paradigm. According to the Institute of Scrap Recycling Industries (ISRI) approximately 31 percent of U.S. scrap exports, valued at more than $5.6 billion, were shipped to mainland China in 2017. China also accounted for 51 percent of the world's plastics scrap imports and historically has been the largest importer of North America's recyclables. Some importers in China are exploring ways to adapt to the new purity standards and restrictions. "Pelletizing is now a hot topic in China, since pellets are still allowed for import," comments Boxiao Qin, sales manager, China, for TOMRA Sorting, Inc. "Additionally, many of the larger companies are searching for new opportunities outside of China, with some starting recycling facilities in the United States." While this is an option for larger players, Qin sees the new market extremely challenging for smaller companies in China to survive. 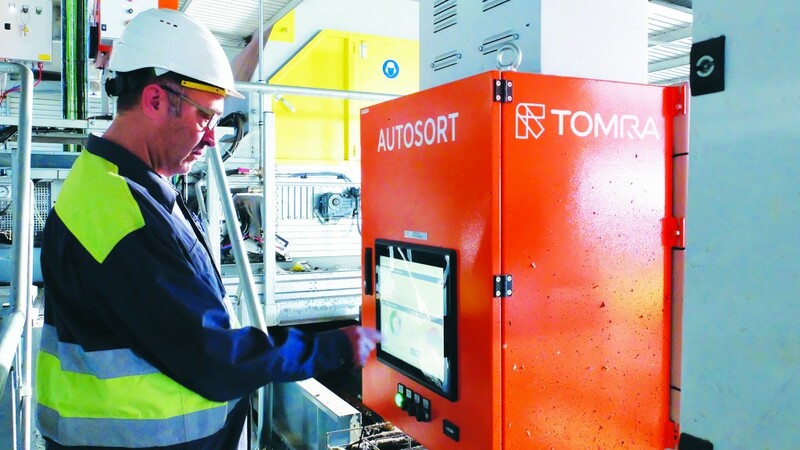 Rather than searching for alternative solutions, Carlos Manchado Atienza, regional director Americas for TOMRA, is challenging the industry and recycling operations to look for ways to improve the quality of recyclables by removing more impurities. "We must recycle smarter," he says. "If we focus on the environmental perspective, it makes no sense to send heavily contaminated recyclables around the world. Today, the technology exists to deliver values for food grades in PET recycling of less than 50 parts per million, practically reaching the quality of virgin material, and we can do the same with many other resources." Historically, China and other countries accepted material with purity levels ranging from 90 to 95 percent or, conversely, impurity levels as high as 10 percent. Recycling companies equipped their facilities with circuits that included sensor-based, optical, laser and other automated machines combined with manual pickers as the last line of defence to remove impurities and meet these standards. This dramatic purity standard shift to 99 percent or greater by the market's largest importer has recycling and scrap facilities in many countries looking for other outlets for their second-life products. However, finding a single-country replacement for China, which had imported a majority of the world's plastics scrap, is not practical. If a recycling facility chooses not to increase purity levels of its finished product, then the material will have to be split between multiple countries, increasing sales costs. At the same time, the glut of recycled material on the market is placing severe downward pressure on commodity prices. Some material prices have already dropped sharply as the market adjusts to these new restrictions. Adding insult to misery, companies should expect shipping costs to increase, as ships previously sent directly to China were quickly returned to the originating country, loaded with consumer goods for sale. Margin challenges aside, operations deciding to seek out alternative markets rather than upgrading the facility do have options. Potential lies near China in developing Southeast Asia countries such as Vietnam, Thailand and Indonesia. Also, India and South America are alternatives to receive the thousands-of-tons-per-year of recyclables left stranded by new China restrictions. Alternatively, large markets such as North America can look to more long-term solutions by further developing and enhancing the internal market for paper, plastics, ferrous and nonferrous recycled material. While requiring substantial investment to develop new and more powerful market models to properly manage the market's waste resources, it would deliver a competitive boost to the market and advance sustainability efforts. For companies weighing the balance between increasing product purity and finding new markets, serious consideration must be given to the investment in new equipment, installation downtime and ongoing operating costs. "At the end of the day in the nonferrous markets, the decision comes down to cost-per-pound to process the material compared to the price they can get for the product," says TOMRA's Eric Thurston. While Manchado Atienza agrees with Thurston, he offers another consideration the industry must factor into the equation as it moves forward in today's market environment. "Companies can seek out alternative markets for their products, but we should always work to improve quality to avoid encountering a ban similar to China's from another market," he says. id-size facilities processing approximately 10 tph of recycled material will, on average, employ two pickers, whereas large operations will use five to eight pickers for processing 45 to 90 tph of material. "Depending on the location, U.S. recycling facilities typically figure a picker's salary from $35,000 to $50,000 per year when determining costs," explains Thurston. If adding overhead to pull impurities from the final product doesn't make financial sense for the operation, then upgrading the circuit either through constructing a new facility or adding new technologies to the recycling configuration is another option. Building a new facility, however, can take months and cost millions of dollars. The more economical route is to work with experts focused on sorting technologies and offering global experience to investigate what equipment upgrades are necessary to meet more stringent standards. This option can often be done at a fraction of the time and cost of building new. Depending on the type, age and condition of the equipment, recycling operations can expect to invest $180,000 to $360,000 in equipment to increase purity levels required to meet more stringent regulations like National Sword. "Companies need to be aware of the cost for both the value-added and non-value-added equipment for new technology integration," offers Thurston. "Look for value-added equipment that can be easily integrated into the existing circuit. Otherwise, the cost for conveyors and other non-value-added additions can add up quickly." There are potential side benefits to adding new technology to the circuit. This approach can reduce the number of pickers required to remove impurities, giving operations options for more efficient workforce utilization to reduce overhead and long-term operating costs, resulting in a short ROI for the new equipment. However, not all technology upgrades are equal, and recycling operations must investigate closely into which works the best to meet established purity goals. Some upgrades require complete circuit add-ons, which demand more time and cost, additional non-value added equipment, and more space. Other technologies can be added onto existing equipment in the circuit, saving space and installation costs.In addition to the cost of new technology, equipment lead-time and plant downtime should also be factored into the investment equation. With recycling operations focused on circuit upgrades to meet tightening standards, equipment lead-times have lengthened. "The time from when the equipment is ordered to when it arrives can range from 12 to 20 weeks, and the plant builder will require an additional one to two weeks for installation," says Thurston. Amy Guan, sales engineer for TOMRA, recommends that a facility work closely with technology experts to make sure all the upgrade goals are met. "The goal is to upgrade the equipment in order to meet these stringent standards, and technology experts and plant designers will have the expertise to make this a reality," she says. "The last thing a facility wants to do is make equipment upgrades that don't meet goals and have the cost associated with a shipment rejected for not meeting purity standards." Sorting equipment manufacturers are introducing a host of new products to help recycling operations stay ahead of the purity curve. Suppliers have recently introduced air systems and laser detectors, to supplement NIR technology that does not sort all impurities from waste paper and cardboard. As a result, many equipment manufacturers and plant designers are upgrading their test facilities, so customers can ensure new technology added to their circuit will remove impurities and attain the desired purity from their feed material. The main impurities left behind by existing sorting circuits that manual pickers must remove are black items, such as plastics and rubber, as well as glass. Recycling facilities must closely examine the main impurities and determine the right technology that will work best without significantly increasing processing costs. "Technology is the crucial investment to achieve all new regulations, as well as future requirements, so recycling operations must choose a partner focused on continuing product developments to respond to evolving market needs," advises Manchado Atienza. Whether adding new technology, more stages with existing technology or increasing the number of pickers to upgrade purity, Thurston reminds recycling and scrap facility operators to consider upgrading the entire circuit. "Now is the time to look at all components to see if upgrades are needed to make the process more efficient," he recommends. "Consult with your equipment supplier to analyze all circuit components including shredders, magnets, screens, conveyors, optical sorters, electromagnetic sensors, etc. to make sure all are working well together efficiently." Because in the end, improving the final product that facilities offer customers is not only about advancing the recycling industry, it's also about making money. This article was provided by TOMRA Sorting Recycling, and was originally published in the May/June 2018 edition of Recycling Product News, Volume 26, Number 4.